I'm so happy this got postponed. I really thought someone would... well it ain't happening so it doesn't matter. 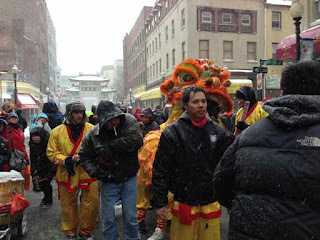 But if you are looking for something to do, Chinatown Main Street still has an event from 12-3 (indoors) at 2 Boylston. I believe East West Bank also has something going on around the same time. And we will be stopping by there as well for a dance. Woo Ching White Crane will be performing at St.James Church, which has it's New Year's event. And of course the restaurants and Dim Sum are still open. So you can still come to Chinatown this weekend. But nobody will be standing around outside in -17 degrees -35 with wind chill. Anyway, I'll still be busy tomorrow. Chinatown Main Street also has some folk dancing which I am going to try and catch. I heard some buzz about people wondering if this parade was on. It's postponed till the 21st. But there is still stuff to do. Spread the word.